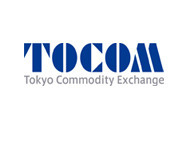 The Tokyo Commodity Exchange (TOCOM) announced that April 2013 trading volume averaged 155,999 contracts per day, up 38.5% from March 2013. Average daily volume for Gold and Platinum increased significantly, offsetting decreases in Crude Oil and Kerosene: Gold was up 71% to 81,898 contracts and Platinum was up 12% to 20,240 contracts. Crude Oil was down 1.4% to 5,491 contracts and Kerosene was down 14.7% to 3,944 contracts. Volume increases are considered to have originated from heightened volatility during the month. In the first half of April, prices remained high at TOCOM with expectations of an economic recovery gaining momentum and a depreciation of the yen. Later in the month, commodity prices dropped sharply with economic uncertainty after the FRB discussed a possible reduction of QE3 and the announcement of a slowdown in Chinese GDP. The sharpest price declines were in Gold and Platinum: Gold (back contract month) fell from the month’s high of 5,078 yen per gram on April 11, to 4,132 yen on April 16. Platinum (back contract month) fell from 5,000 yen per gram on April 10 to 4,301 yen on April 16. The market recovered somewhat toward the end of the month. Open interest at the end of April for all listed products totaled 304,048 contracts, a decrease of 82,682 contracts from the prior month.